Explore Research tools to connect with dictionaries, translations, and more in PowerPoint 2010 for Windows. 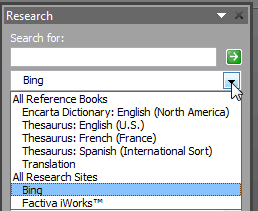 This action opens the Research Task Pane on the right side of the PowerPoint 2010 interface (highlighted in red within Figure 2). Thesaurus English: This provides alternate words in English. Learn more in our Thesaurus in PowerPoint 2010 for Windows tutorial. Translation: Provides translations from one language to another. Learn more in our Translation in PowerPoint 2010 for Windows tutorial.